It is a very big deal what happened in Fukushima, Japan. Workers that signed up to contain the nuclear reactor meltdown, have all accepted the fate of death. Like modern day Samurai warriors they have put their life on the line to save us from a large scale world wide crisis. Now we are learning through different media outlets that all hope is lost to contain this meltdown. Now our only hope is to contain the radioactive rods in pure concrete like what was done in Chernobyl, France when they had their reactor core meltdown. Don't believe the lies that some news reports are telling you that there was no health problems due to that meltdown. These are all lies. Many people lost their lives in that incident, and as many physicists say today, all humans on this Earth have some traces of Chernobyl inside of them. Here is Dr. Michio Kaku saying just that on the David Letterman show. There you have it. We all have a piece of Chernobyl in our bodies. However, Chernobyl was one reactor. I am not a physicist but I know when there are a total of 6 reactor cores at the Fukushima power plant, with multiple meltdowns, compared to Chernobyl's 1 reactor, we are going to have a lot more radiation in our bodies now. This is in addition to every exposure you have personally had to radiation in your entire life span. If you fly more than a normal person, and you get scanned regularly with TSA's new naked body scanners, then you are at greater risk of cancers, and death. This is very scary. I don't think Dr. Kaku eased my mind at all with this appearance on The Late Show with David Letterman. When does a physicist get featured on David Letterman? Notice how he talks about putting pressure on the politicians to ban products? This is all to sway your better judgement, even David Letterman is clicked in with the New World Order. Next they will be talking about LHC and poking fun at it! This I believe was to keep people as calm as possible. Lets not forget about Ann Coulter telling everyone that radiation could be good for you. How ridiculous. 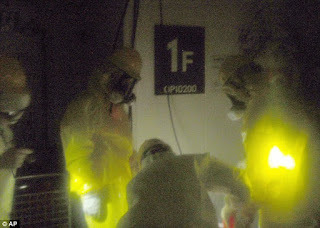 The dead bodies around the Fukushima power plant are so radioactive, they have begun to harvest, and quarantine them. This is because they fear they could contaminate the soil. They have only admitted to quarantining about 1000 bodies but you know the body count will surely go up. All of these dead radioactive bodies pose another risk. The risk of horrible disease. God help Japan. As for physicist Dr. Kaku and his family? They have left the whole area. Don't be naive we are all going to feel this one. Ocean water around the Fukushima power plant has been tested and is 4,500 times more than the regulatory limit set by the EPA. Milk has become contaminated along with spinach, and probably other kinds of food. This is not the end, this is only the beginning. Cesium-137 is a radioactive isotope that is contaminating the area around the power plants. It has a half-life of 30 years! That means that its going to be here for a very long time. Please leave comments and let me know what you think, or if I have left anything out. Thanks. It appears that the problem now is they sprung a leak and extremely radioactive water is just pouring into the ocean unabated. So how long before that contaminates everything around the island and elsewhere? Not long I would guess. This is a major problem six ways from Sunday!